Jabra GN2100 vs Plantronics HW251 - Headsets Direct, Inc. COMPARING THE JABRA GN2100 HEADSET WITH THE PLANTRONICS HW251, THE PLANTRONICS HW251 WINS! When comparing the Jabra GN2100 headset with the Plantronics HW251, the information below shows the Plantronics HW251 to give more value for your headset investment. Newer telephones and VoIP systems are now coming with wideband frequency response so you’ll want headsets of equal standards. The Plantronics HW251 provides wideband audio for a more natural sound and clearer conversations. 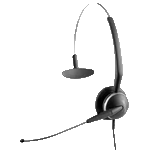 The Jabra GN2100 headset uses older, narrowband frequency for analog systems. Better Performance and All-Day Comfort. The Plantronics HW251 has an ear cushion sizably larger than the Jabra GN2100. A larger ear cushion will block more noise so you can hear your caller better while being softer against the ear for a more comfortable fit. Both headsets use the same design with a tube to transmit your voice up to the ear piece where the microphone resides. The Plantronics HW251offers a replaceable voice tube where the Jabra GN2100 does not. The Jabra GN2100 does weigh less than the Plantronics HW251 comparing 21 grams to 54 grams. Because the wearing style allows the headband to disperse the weight across your head, you will have a hard time telling the difference. 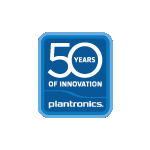 We have found time and time again Plantronics’ after sale support is unparalleled in the headset industry. If you need a replacement unit, Plantronics quickly sends a replacement unit to get you up and going. No questions, delays or run-around. They simply want you up and going with their headsets working properly. We’re so confident in the Plantronics HW251 outperforming the Jabra GN2100 headset, we have a 60-day money back guarantee. Try it for 60 days and if you’re not 100% satisfied, return it. No questions asked. 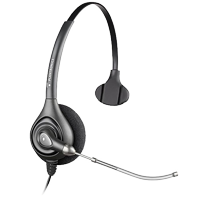 Just give us a quick call at 1-800-914-7996 or order the HW251 headset here online. What other items are required? You will need an amplifier or bottom direct-connect cable to plug in-between the HW251 and your phone. It’s best to call us to determine compatibility. The HW251 is a commercial grade headset. It’s sound quality will be equal to if not better than your current handset. By using a headset, you also gain the benefit of being hands free to write or type giving you a huge productivity boost. Setup takes 2-3 minutes. After the first couple days your ear will quickly adapt to the better audio quality and you’ll forget you have it on. How often should I change the voice tube and ear cushion? 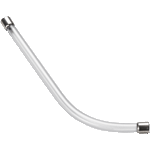 The voice tube has a screen at the end and if you eat while wearing it or wear makeup, food and other particles can clog the end which reduces your voice volume. At that point a replacement is necessary. If you don’t eat with it and makeup doesn’t rub against it for example, you may never need to replace the tube. 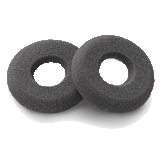 As for ear cushions, again it depends on simple wear and tear. If you take care of your headset, they will last for year. If you’re rougher with it, you may need to replace more often.